This page was prompted by reports from new users of Mozilla Web browsers — Firefox, SeaMonkey, Camino, and others — that the browsers are broken because they don't display certain Web pages correctly. Almost always, the fault lies in the Web pages (which fail to conform to published specifications) and not in the browsers. Very often, the affected pages were created by so-called professional Web developers whose own Web pages are equally defective. Note that the information presented applies regardless of the browser you use. This is not a defense of Mozilla. Instead, this is a defense of standards that affect all browsers: Internet Explorer, Firefox, SeaMonkey, Safari, Opera, Konqueror, Chrome, and all the rest. I am not an employee of the Mozilla Foundation. My only affiliation with that organization is that I use the freeware SeaMonkey browser, which is based on Mozilla developments. Note well: I am not a professional Web developer. I developed and maintain my own Web site, and I was the unpaid Web master for a charity for several years. This keeps me sufficiently busy that I am not interested in doing any other Web sites. Thus, I am not trying to take business away from any professional Web developer. The purpose of this page is to aid those planning to use professional Web developers by informing those potential customers about issues of technical quality. My emphasis on the W3C specifications and WAI guidelines serves to promote the Viewable With Any Browser Campaign, which is necessary as the dominant browser continues to lose market share. Also note that there are several professional Web developers with names the same as mine. I do not know any of them. Doing a Google seach on my name, I examined the first three such developers. Only one had a home page that was error-free. None of them are listed below. With the continued erosion of IE's share of the browser market, this is unacceptable. Web pages that can be viewed as intended only with IE ignore 50% to 70% of their potential audience. Worse, non-standard Web pages can also completely exclude any audience that is handicapped, an audience that relies on specialized Web browsers (e.g., audio browsers for the blind). A commercial Web site that excludes the handicapped from its potential audience risks legal action against its owner under the Americans with Disabilities Act (ADA). Some Web developers promote themselves through E-mail — SPAM! Web developers should have sufficient pride in their abilities to show examples of their work. NEVER contract with a Web developer where you have not first seen the developer's own Web site. A legitimate Web developer should have its own domain with both E-mail and Web pages. Do not even contact developers who hide behind Yahoo, Hotmail, or Gmail E-mail services. While many individuals (including my own children) make good use of such services, a message from a business with such an E-mail address is generally spam. To fight spam, NEVER respond to it. Unless you want the public to associate you or your company with spam, never hire a Web developer who uses spam to advertise. One very persistent spammer was CMLS China. The messages themselves were HTML-formatted using invalid HTML and CSS. The home Web page for CMLS China also contained HTML and CSS errors. The spam messages suggested you visit the CMLS China Web site, giving an invalid URI. CMLS China is no longer in the list below because I can no longer locate a valid URI for testing its Web site. In the chart below, developers who have used spam to advertise are indicated with a bold S.
The HTML (or XHMTL) was evaluated using the W3C HTML Validation Service. Where a plus (+) appears after an HTML error-count, the page could not be initially tested because it lacks an important declaration. The page was tested by forcing the validation tool to assume the existence of that declaration. This is an error not included in the error-count. The style-sheet was evaluated using the W3C CSS Validation Service. Where two or more pages for a given developer were evaluated, the error-counts might reflect duplicate errors from the same external style-sheet file. However, a page might also contain an internal style-sheet unique to that page, which means different errors are counted. Thus, error-counts cannot be added to obtain a total for the Web site; but one page's error-count does not necessarily characterize the whole site. Where an X appears in the CSS column of the table below, it indicates a page that uses no style-sheet. Given the importance of style-sheets in modern Web page design, this lack may indicate a significant deficiency in the Web developer's capabilities. The number of Flash or similar media presentations were counted. The two cited evaluation tools are readily available and free. There is really no excuse for a Web developer not to use them as part of its quality assurance process. This page that you are now viewing was tested. The initial version did have errors, but they were all corrected before this page was released for public viewing. Only errors are reported, not warnings. Where both error criteria (which excludes Flash) show no errors, the entry is highlighted in bold Italics (except if viewed with style-sheets disabled). Think: If Web developers cannot create error-free Web pages for themselves, what kind of garbage will they create for you? Ambrosia Web Design 1 Nov 12 This developer appears defunct. But see the Notes regarding Ambrosia Web Design and its owner. Digital Web Enterprises (S) 7 Aug 17 home 4 50 ? Spotlight Custom Web Design (S) 15 Jan 14 No Web site could be found for this spammer. The true owner of its domain spotlight-image.net was hidden by an anonymous domain service. It is possible that this is not even a Web design service and might instead be a source of malware. Amara Grimes Design and Plan B: For each of these, the home page is one large Flash presentation. The page is otherwise blank. Unlike Curvine Web Solutions and ooLite Media, however, there is only a single Web page. Selecting a link within the Flash launches a new Flash presentation in that same page. With all content and navigation embedded in Flash, these nevertheless had HTML errors. Ambrosia Web Design: This company was identified in a Los Angeles Times article as owned by a Chris Ambrosia. Chris Ambrosia is also the registered owner of CAM Services Direct, which operates at the same address as Ambrosia Web Design. According to the newspaper article, CAM Services Direct is a front for telemarketing that violates the Do Not Call Registry and might be an identity theft scam. On 1 November 2012, the Federal Trade Commission announced legal action against both Ambrosia Web Design and Chris Ambrosia (and others) for "unfair or deceptive acts" in violation of federal laws, including "misrepresenting affiliation with a government entity". Before going defunct, the home page for Ambrosia Web Design was NOT error-free. All this indicates the risks of dealing with a Web developer that cannot even create an error-free Web site for itself. Curvine Web Solutions, ooLite Media: The home page is one large Flash presentation. The page is otherwise blank (except perhaps for a copyright notice). BEWARE! My browser's blockers of malware and phishing sites prevented me from viewing the Web site for Digital Web Enterprises, which sent me spam. Thus, I am not even sure the name of this firm is correct. In any case, I strongly suspect this is NOT a Web development firm but is instead an attempt at fraud or worse. This is an example of why dealing with a spammer can be a very bad idea. The spam from Gleaming Technologies asserted that "We maintain Web 2.0 standards and W3C validations in all the websites we design and develop." W3C validations of their own Web site, however, showed errors. Page O Rama and Weebly are online, do-it-yourself sites where you create your own Web sites. Modernizing Medicine appears to have registered an invalid domain for a client. The domain ends with .md; and the client is a physician in Maryland, US. Thus, I cannot tell whether .md represents "Medical Doctor" or "Maryland". In any case, the top-level domain .md is reserved for entities physically located in the east European nation of Moldova. NewpathWeb spammed a Web forum where the topic was about making Web sites viewable by all browsers. Nexternal Solutions created at least one commercial Web site with invalid sniffing, thereby locking out potential customers. WebsiteWizard and Yola are actually sources for do-it-yourself Web design tools, not Web design services. The presence of HTML and CCS errors on their own Web sites — if they use their own tools to create their own Web pages — indicates a lack of quality in their tools. Advanced Access, LoopNet, and Superlative develop and host Web sites for real estate agents. "Pehrson Web Group is a project of CES Business Consultants" [from the Pehrson home page]. CES Business Consultants not only plagiarized one of my own copyrighted Web pages but also syndicated it to other Web sites. RealtyTech develops Web sites for real estate agents and supplies applications for agents to develop their own sites. Potential customers should be aware of not only a firm's technical competency but also its business ethics. Copyright infringement is unethical, unprofessional, and — in some cases — criminal. If a Web developer lazily plagiarizes copyrighted content and then charges customers as if the content were newly developed, in what other ways is that developer ill serving customers? Any business contracting with an outside service for Web development should specify in the contract that all Web pages comply with the HTML or XHMTL specifications and that any style-sheets comply with the CSS specifications. Final payment for the service should be withheld until compliance is successfully verified. Further, I urge customers of Web developers require compliance with either the U.S. Rehabilitation Act (also known as the Americans with Disabilities Act or ADA) requirements or WAI guidelines for accessibility. NOTE: For simplicity, "Flash" is used here also to include HTML5 Media and other such media presentations. For vivid graphics that truly help promote a product or service, Flash, HTM5 Media, and other media presentations can be very effective. A number of these developers make extensive use of these on their Web pages. However, several of their Web pages use them to present links and buttons for site navigation. In February 2012, Adobe (the developer of Flash) announced that it would soon cease development of new versions of Flash for Linux systems except as embedded in Google's Chrome browser for those systems. On Linux systems, browsers other than Chrome will be relegated to staying with Flash version 11.2 (the current version); no subsquent Flash versions will be developed for non-Chrome Linux browsers. Web sites that depend on Flash displays might thus begin to lose some of their potential audiences. Many Web users disable Flash. They do this because the presentation files are quite large. Many individuals who access the Internet at home still do so through dial-up modems. Further, many Web servers cannot consistently deliver content at broad-band speed to those with DSL or cable modems. Thus, the choice is between tying up a computer for a minute or more to download the presentation or simply disabling Flash. When a Flash presentation is finally downloaded, it can be so complex that the process of displaying it freezes all other functions of the user's computer. An Italian restaurant that my wife and I like has such a Flash for its home page. I could not even terminate my browser while Flash presented a slide show promoting the restaurant. Worse, all navigation into the Web site from the home page was embedded within the Flash presentation. Where a Flash presentation is necessary for site navigation, the utility of the Web site for promoting a business is destroyed when a user disables Flash. Web users who have disabled Flash are more likely to go elsewhere on the Web rather than enable Flash to navigate a site. Also, Flash presentations are often inaccessible by the handicapped. Flash is a programming environment and should be used to offer users additional power and features that are unavailable from a static page. Flash should not be used to jazz up a page. If your content is boring, rewrite text to make it more compelling and hire a professional photographer to shoot better photos. Don't make your pages move. It doesn't increase users' attention, it drives them away; most people equate animated content with useless content. Using Flash for navigation is almost as bad. People prefer predictable navigation and static menus. Customers of Web developers should carefully question any plans to use Flash, to ensure that visitors to their Web sites are not driven away by gratuitous graphics or by graphics that are required for site navigation. Otherwise, you might be paying for a feature that is counter-productive. In any case, no meaningful text content should be presented within Flash. Such content cannot be processed by audio browsers. With such content, users cannot resize the type, change the color of the type or background, change the font, or make other adjustments to improve readability. Here, accessibility is an issue not only affecting the blind. It also affects those who are color-blind, have dyslexia, or whose eyes are merely getting old. However, Flash itself should not be considered a bad feature of a Web page without considering the context in which it is used. For example, Flash can be quite effective for displaying a product in action. Thus, the column showing the count of Flash presentations in the table above is separate from the columns showing errors. Just before the list of developers, I indicate that I validated the HTML and style-sheets (CSS) of their Web pages. Why is this important? When I was a software test engineer, one of the first questions we would ask before starting to test a software package was: "Were there any compilation errors?" We would refuse to test it until it compiled error-free. We would not test garbage. Validating both the HTML (or XHMTL) and CSS of a Web page is very similar to compiling computer software. And the consequences of errors is also similar: A Web page with HTML and CSS errors will display unpredictably. No truly professional Web developer should deliver a Web page that cannot validate error-free. This is something clients of Web developers must demand. After all, would you purchase software that fails to compile correctly? Yes, some browsers are tolerant of HTML errors, often unintentionally as the result of bugs. Some Web developers try to take advantage of that tolerance, intentionally making use of those bugs. However, are you trying to reach an audience that only has buggy browsers; or are you trying to maximize your audience? And what will you do when your audience upgrades their browsers to newer versions in which the bugs have been corrected or (worse) behave differently? Note, however, that validating a Web page merely checks to determine if the HTML and CSS syntax comply with the World Wide Web Consortium (W3C) specifications. The spelling, grammar, and punctuation of text are not checked. The aesthetic appearance of the page is not checked. A Web page that has been validated should be merely presumed to comply with standards, the next topic. Light bulbs and lamp sockets are manufactured according to compatible standards. This is necessary because the several companies that make bulbs — including compact fluorescent (CFL) and light-emitting diode (LED) bulbs — need to ensure their products can be screwed into the sockets made by several other, unrelated companies. Similarly, Web pages are written by individuals not associated with the companies that create Web browsers. Thus, the files that constitute Web pages must meet standards compatible with those used to create browsers. To make the Web accessible to all by promoting technologies that take into account the vast differences in culture, languages, education, ability, material resources, access devices, and physical limitations of users on all continents. Strictly speaking, W3C does not create standards. It provides specifications. Lacking any competing specifications that are not proprietary and tailored to a particular manufacturer's product, however, the W3C specifications may be considered as standards. The University of Minnesota Duluth presents an extensive list of Web sites that discuss the need for following standards when developing Web pages. We are not interested in presenting ourselves to those with Web-capable cell phones, to the handicapped, or to the 50% to 70% of the world that use non-IE browsers. And we are not interested in search engines finding us. Cartoonist Dan Piraro vividly illustrates the importance of standards. A browser can only do what we tell it to do. What a Web developer wants must be expressed according to the standards. 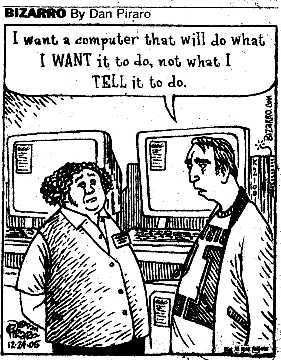 Only then will tell = want without regard for what brand of browser is used. Otherwise, there may be significant differences between how the developer wants a Web page to appear and what his page tells my browser to display. If my Web page complies with the W3C specifications and was checked by viewing it with a standards-compliant browser, any problem you have with viewing it as I intended is the fault of your browser. You can upgrade your browser or change to the product of a different company. If you are using a current browser version, you should notify the company that developed it that it has a bug. If your page does not comply with the specifications — or worse uses proprietary capabilities found in only one company's browser — any problem that I have with viewing it as you intended may easily be the fault of your Web page. You need to fix your page before pointing an accusing finger at my browser. If you don't care, then I don't choose to view your page. Other characters that are illegal according to RFC 3986 (e.g., \) are also occasionally found in URIs; not all browsers can convert such characters successfully into bytes that can be translated. Users often complain that their browsers are buggy in such cases when the fault actually lies within the Web page containing illegal URIs. RFC 3986 also specifies that, when quoting a URI, it should be bracketed within < and > (as seen above). A non-technical overview of Web terminology might be helpful, not only for understanding the table above but also to help when choosing a Web developer or discussing your needs with a developer. A Web page is what a user sees in the browser window. Primitive pages consist entirely of unformatted text, such as the page for RFC 3986 cited above. However, most people think of formatted pages when discussing the Web. A formatted Web page consists of three major parts, each in their own files: HTML, style-sheets, and images. HTML stands for "hypertext markup language", an annotation used to format a Web page. The term "hypertext" refers to the use of links in a page to reach other pages. HTML is used to describe the language used in the page (e.g., English, Russian, Chinese), the characters used for text in that language (e.g., Roman, Cyrillic, Greek), the layout of text into paragraphs and tables, and the placement of graphics. HTML also creates the links to other Web pages. Most important, the actual text of a Web page is contained in the HTML file. To view a Web page, the user generally requests the HTML file for that page (thus the extension htm or html in a link). Some pages — especially pages displayed as frames — use multiple HTML files. For this discussion, HTML also includes XHMTL and other markup languages, each of which has a formal specification under the control of the W3C. It also includes dynamically-generated PHP files. Embedded style specifications at the place within an HTML file where the formatting applies. Style-sheets also have a formal specification under the control of W3C. Images are the graphics seen on a Web page. They can serve merely as decoration or to illustrate a point. Images can also be the primary purpose of a Web page, such as a display of photographs. Images are generally either GIF (Graphical Interchange Format) or JPEG (Joint Photographic Experts Group) files. The former is a patented format of Compuserve freely used in the computer industry with Compuserve's permission; the latter is an international standard. BMP (Bit Map) and PNG (Portable Network Graphics) image files are also seen; both of these are international standards. Besides HTML, style-sheets, and images, Web pages might contain other features such as audio, streaming video, and Flash. For more Internet-related terms, see my Internet Glossary. Whether the Americans with Disabilities Act (ADA) applies to commercial Web sites and the sites of state and local governments is not clear. However, that will soon be made very clear. On 2 October 2007, Federal District Judge Marilyn Hall Patel certified a class-action lawsuit that alleges the Target Corp violates the ADA (and California laws) because audio screen-reading software cannot work on parts of Target's Web site, making the site unusable by the blind. Since Target's Web site is a means of on-line shopping, this is indeed a commercial site. Target indicates it will appeal Judge Patel's ruling. Whatever happens, the result will be a definitive determination whether the ADA applies to the Web. Note that federal law explicitly requires the Web sites of federal agencies to be handicapped-accessible. However, many federal sites are in violation of that law. Target settled the lawsuit rather than go to trial. This means that a judicial decision whether the ADA applies to commercial Web sites has not been made. We often think of accessibility in terms of physical barriers: stairs confronting those in wheelchairs, door knobs impossible to work for those with arthritic hands, and distant parking spaces creating excessively long walks for those with heart disease. With the Web, there are communication barriers. The deaf cannot hear streaming audio and arthritic hands might not be able to grasp a mouse or work a track-ball. The largest problems confront those with visual handicaps. Some of these problems even affect the rest of us. A color-blind person cannot read red text against a green background. Even without color-blindness, red text against a patterned yellow and orange background may be difficult to read for all of us. Highly stylized fonts can confuse a person with dyslexia. Unusual fonts might exist on the computer of the person creating the Web page but not on the computer of a person reading it. A partially blind person needs large type to read, but fixed font-sizes prevent changing the size. The rest of us may also have problems with small type as we age. This is a special problem if "text" is actually a graphic image of text (e.g., the labels on navigation buttons) with no real text available as an alternative. Information contained only in an image or Flash presentation is unavailable to a blind person using an audio browser. This last only touches a much more serious problem. Audio browsers function poorly — or fail entirely — when Web pages do not comply with published HTML specifications. This is the most important consideration for making Web sites accessible to the handicapped: the pages need to comply with the W3C specifications. After embedding content in an image, the next most significant barrier against visually handicapped users is the prevailance of faulty sniffing. When a Web site has different versions of its pages for Internet Explorer, Firefox, and Chrome and rejects all other browsers, audio browsers are unlikely to work. In this case, sniffing must provide a default version of the site's Web pages for any browser not otherwise recognized. Furthermore, the default version must comply with the W3C spcifications. Other considerations relate to design characteristics that maximize the user's options (e.g., allowing the user to change fonts and font sizes, override colors). For audio browsers, pages merely have to be coherent if displayed as plain text, without images or formatting. Such a display might not be aesthetic, but it should be understandable. The Web Accessibility Initiative (WAI) — a program of W3C — has three levels of rigor in its Web Content Accessibility Guidelines (WCAG). Title 29 of the United States Codes §794d(a) (29 USC 749d(a)) contains the mandate for government Web sites to be accessible. See also Policies Relating to Web Accessibility. In an attempt to create Web sites for all browsers, some Web developers create a separate set of Web pages for each major browser. They then try to take advantage of non-standard peculiarities of each browser to enhance those pages. To detect which browser is accessing a Web site, the Web server is programmed to "sniff" (detect) the browser's user agent (UA) string. The UA string is an identifier sent by each browser when requesting a Web page. After sniffing for the most popular browsers, other browsers should not be ignored. If a Web site sniffs for Internet Explorer, Firefox, and Chrome, it must also provide for displaying pages for Opera, Konqueror, SeaMonkey, Safari, and others. For details on why servers should not sniff for Firefox and — only if there is indeed a valid reason to sniff at all — should sniff for Gecko, see Gecko is Gecko. Users of browsers that cannot properly view Web pages because of incorrect sniffing should see my Browser Sniffing: Detecting It, Dealing With It, and Defeating It. The site must sniff for the correct portion of the UA string. Mozilla-based browsers — Firefox, SeaMonkey, and others — all use the same Gecko engine. These browsers differ merely in their user interfaces (menus and toolbars) and in some cases the hosts on which they operate. It is the Gecko engine that interfaces with Web servers, negotiates security, and displays Web pages. Thus, a server should be sniffing for Gecko and not Firefox. Over 100 commercial Web sites are known to violate this rule. Sniffing for a particular version of a browser must not ignore other versions and must provide for future versions. When Internet Explorer 8 had more users than any other single version of Internet Explorer, it had less use than the combination of Internet Explorer 7 and Internet Explorer 6. Do you sniff for Gecko 1.8.1.17 or for all sub-versions of Gecko 1.8? And did you update your Web site when Gecko 1.9 went into use? The currect version of Gecko is 38.0. Many browsers have options that easily allow users to spoof other browsers by sending fake UA strings. Using SeaMonkey, I can spoof Opera, Firefox, and Internet Explorer (including IE 5.0 on a Mac). This completely defeats the purpose of sniffing. This clearly indicates sniffing for Firefox without concern for the context. As noted above sniffing for Firefox is wrong; if sniffing is necessary, the correct term is Gecko. I used to assert that sniffing should not be necessary if Web pages complied with the W3C specifications and also followed the the guidelines of the Viewable With Any Browser Campaign. However, if a Web site is to be viewed not only on a computer but also on a tablet, iPad, and smart phone, then the pages need to differ for each such platform. This requires sniffing but for platform functionality or features and not for the brand of browser in use; how to do that is well beyond the scope of this Web page. One aspect of a secure Web site is the site certificate. The site certificate is, of course, installed on the Web server. However, if there is an intermediate certificate, that too must be installed on the server. Too often, intermediate certificates are not installed. If you are paying a Web developer for a secure Web site, you will likely also have to pay for a site certificate. Make sure your developer not only installs the site certificate on your server but also installs any intermediate certificate. Since a site certificate is issued for a particular domain, if you decide to change the name of your domain, you will need a new site certificate. There is another form of sniffing. Secure Web sites (e.g., those where you access your bank account) sometimes sniff for your IP address. The intent is to determine if you are using the same computer that you used before; the computer is being authenticated, not the user. If a site finds an IP address different from the one you had when you previously logged-on, you are required to go through additional steps before you are allowed to logon. The problem is that, if you access the Internet through a dial-up modem (as do about 10% of the Internet users in the U.S.), your IP address changes every time you connect. Even with a broadband connection, your IP address might change if you reboot your computer or modem (e.g., after a power failure, after a shutdown for a vacation, after installing a Windows patch). There are better ways — less annoying ways — to authenticate a user's computer than sniffing an IP address. One way would be to set a cookie on the user's computer with some random string of characters, also saving that string in a database on the Web server. The logon process could then compare the two strings. If they match, the computer is likely the same as the one you used previously. Authenticating by checking IP addresses is actually not very secure. When you disconnect from the Internet, your IP address might then be reassigned to another user who connects through the same ISP. If you are having a secure Web site developed (e.g., for E-commerce), you should ask the developer how customers will be authenticated when they logon. Unless you want to annoy your customers, be sure that authentication does not involve sniffing for IP addresses. Some larger businesses and many government agencies have internal organizations for Web development. Non-profit organizations often rely on unpaid volunteers. This avoids any problems caused by using incompetent outside Web developer firms, but it does not excuse them from HTML and CSS errors or from having pages that are inaccessible to the handicapped. There are no generally accepted qualifications required when a person presents himself or herself as a Webmaster. Often, internal organizations tasked with creating Web sites are staffed with personnel who do not even know that the W3C exists, let alone that there are internationally accepted specifications for HTML and CSS. In federal agencies, such personnel might not know that there is a law mandating accessibility let alone what guidelines should be followed. Too many managers lack technical experience. Far too readily, they accept the concept that, if Micro$oft says "It's okay", then it must indeed be okay. They provide Micro$oft's FrontPage to their staff as the tool for generating Web pages; they might even tell the staff to use Word, which is notorious for creating bad HTML. They believe that, if a Web page looks as intended with Internet Explorer, it looks okay to the entire world. They do not realize that they have tied their Internet presence to a browser with a steadily declining market share, to a "fading star". When Web sites are developed internally, management must still be concerned about reaching the broadest possible audience. Thus, they should require a quality assurance process that subjects each Web page to the same two error tests that I performed for the chart on this page. While this testing might not be necessary for each minor update to a page that was already tested, it should be repeated occasionally when a section is added to or deleted from a page. If a Webmaster has any pride in the work she or he performs, this testing should be done even if not required by managers. In any case, managers responsible for how a company or agency presents itself to the public should be concerned about how Flash is used, about adherence to standards, and whether that presentation is accessible not only to the handicapped but also to any of the 50% to 70% of the public that use non-Micro$oft products to view the Web. Even if you retain an outside Web developer, you should supply all text content for your Web site. In the end, you — not the developer — will be held accountable by others for your site's content. Whether you use an outside Web developer or create your Web site in-house, be careful when creating your text content. If the content libels a competitor or plagiarizes someone else's copyrighted work, you can be the target of a lawsuit. Actually, plagiarism can even be a criminal offense. Some Web hosting services will immediately shut down a Web site against which a copyright complaint has been filed. How would you react if the site for which you paid a significant amount to develop was suddenly terminated? On the other hand, if you create good, original content, be sure that you retain publication rights (e.g., a copyright). Do not surrender your rights to an outside Web developer who might then collect a fee for supplying your content to another customer. After all, you either put your own effort into creating the content, or else you paid someone to create it for you. Only you should be allowed to profit from that work. When a business or organization has a Web site developed, four key recommendations should be followed. If an outside service is used, these should be included in the contract. If the site is developed internally, these should be formal policies imposed on the staff. All Web pages should test error-free using the W3C tools. All Web pages should be compliant with the Americans with Disabilities Act. Any necessary "sniffing" should be for functionality and features. "Sniffing" for user-agent strings should not be allowed. The business or organization must own the intellectual property rights (e.g., copyright) to both the content and appearance of the Web pages.